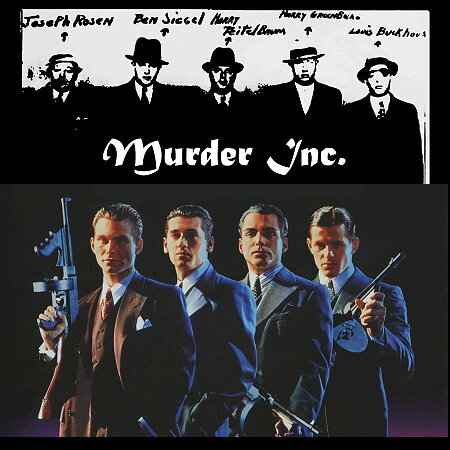 Murder, Inc. (or Murder Incorporated or the Brownsville Boys; known in syndicate circles as The Combination) was the name the press gave to organized crime groups operating in the 1930s and 1940s, that acted as the “enforcement arm” of the Jewish Mafia and later the American Mafia, the early organized crime groups in New York, and elsewhere. Murder, Inc. was responsible for between 400 and 1,000 contract killings, until the group was exposed in the early 1940s by informer and group member Abe “Kid Twist” Reles. In the trials that followed, many members were convicted and executed. Abe Reles himself died, after mysteriously falling out of a window. Several members of the group featured in the 1991 film, “Mobsters”. That was the Hollywood version, MTV-style. Meyer Lansky – Luciano’s right-hand man in the National Crime Syndicate, who helped form Murder, Inc.
Louis “Lepke” Buchalter – original head of Murder, Inc.
Abe “Kid Twist” Reles – Potential witness, who was murdered before he could give evidence against other members of Murder, Inc.
Louis Capone – a member of Murder, Inc. who worked under Albert Anastasia and Louis Buchalter. 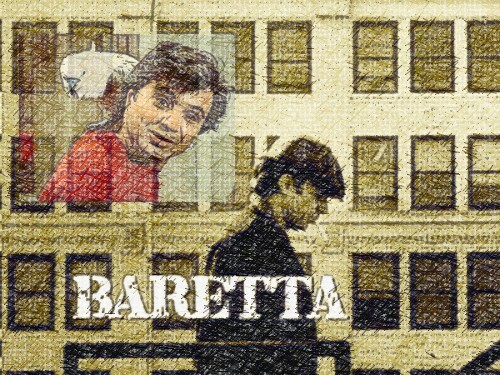 Harry Maione – Leader of the Italian faction of Murder, Inc. Murder, Inc. was established after the formation of the commission of the National Crime Syndicate, to which it ultimately answered. Largely headed by former mob enforcers Benjamin “Bugsy” Siegel and Meyer Lansky, it also had members from Louis Buchalter’s labor-racketeering gang (in partnership with Tommy “Three-Fingered Brown” Lucchese), as well as from another group of enforcers from Brownsville, New York, of the late 1920s, led by Martin “Buggsy” Goldstein and Abe “Kid Twist” Reles, operating out of an unassuming candy store known as Midnight Rose’s. Buchalter, in particular, and Joe Adonis occasionally, gave the outfit its orders from the board of directors of the syndicate. Albert “The Mad Hatter” Anastasia was the group’s operating head, or “Lord High Executioner”, assisted by Lepke’s longtime associate Jacob “Gurrah” Shapiro. In the 1930s Buchalter used Murder, Inc. to murder witnesses and suspected informants when he was investigated by crusading prosecutor Thomas Dewey. Most of the killers were Jewish gangsters from the gangs of the Brooklyn neighborhoods of Brownsville, East New York, and Ocean Hill. In addition to carrying out crime in New York City and acting as enforcers for New York mobster Louis “Lepke” Buchalter, group members accepted murder contracts from mob bosses all around the United States. Murder Inc. hit men used a wide variety of weapons, including ice picks, to murder their victims. Though the group had a number of members, Harry “Pittsburgh Phil” Strauss was the most prolific killer, committing over 100 murders (some historians put the number as high as 500). The killers were paid a regular salary as retainer, as well as an average fee of $1,000 to $5,000 per killing. Their families also received monetary benefits. If the killers were caught, the mob would hire the best lawyers for their defense. Murder Inc.’s best known victim was probably Dutch Schultz, a mobster who had openly defied the syndicate. In October 1935, Schultz insisted on assassinating Thomas Dewey, who was leading an all-out effort to put the mob out of business. The syndicate board overruled Schultz. They feared – with good reason – that Dewey’s murder would inflame public outrage to new heights, and result in an even greater campaign to shut down the rackets. Schultz vowed that he would ignore the board’s decision and kill Dewey himself. The board decided they needed to act immediately, to kill Schultz before he killed Dewey. In an ironic twist Buchalter actually saved Dewey’s life – which allowed Dewey to continue his efforts to bring down Buchalter. Hitmen Mendy Weiss and Charles Workman were given the assignment to kill Dutch Schultz. On October 24, 1935, they tracked down Schultz and his associates Otto Berman, Abe Landau, and Lulu Rosenkrantz and shot them at the Palace Chop House in Newark, New Jersey. Berman, Landau, and Rosenkrantz died almost immediately, while Schultz clung to life until the following day. As the thorough Workman stayed behind to make sure they had completed their assignment and finished off Schultz in the men’s room of the restaurant, Weiss escaped the scene with their Murder, Inc. getaway driver Seymour Schechter. Furious at being abandoned by his confederates, Workman had to make his way back to Brooklyn, on foot. A day or two later Workman filed a ‘grievance’ with the board against Weiss and Schechter. Although he had simply followed Weiss’ frantic orders to drive away without waiting for Workman, the unfortunate Schechter ended up bearing the punishment – becoming a Murder Inc victim himself, a short time later. In January 1940, professional criminal and police informer Harry Rudolph was held as a material witness in the murder of 19-year-old minor gangster Alex Alpert. Alpert had been shot in the back on a street corner in the Brownsville section of Brooklyn on November 25, 1933. While in custody, Rudolph talked with Brooklyn District Attorney William O’Dwyer. With Rudolph’s testimony, O’Dwyer secured first-degree murder indictments against Abe Reles, Martin Goldstein and Anthony Maffetore. After the three were indicted, O’Dwyer learned from Special Prosecutor John Harlan Amen that Rudolph was reportedly offered a $5,000 bribe by another prisoner, on behalf of the syndicate, to “put Reles and Goldstein on the street”. O’Dwyer stated that when Maffetore learned of the bribe offer to help clear Reles and Goldstein and after several talks with New York City Detective John Osnato, he decided to turn state’s evidence. Maffetore eventually stated that he was not involved in the Alpert murder, but was the driver in six other gangland murders. Maffetore then convinced Abraham Levine to talk. Reles was next to cooperate with the District Attorney’s office. The Downfall of Murder Inc. The testimony of “Kid Twist” Reles was particularly important to the prosecution, as he was a more senior gang member, and he is considered the key to the downfall of Murder, Inc. Soon after Reles agreed to cooperate, numerous first-degree murder indictments were issued in Brooklyn, The Bronx, and in upstate Sullivan County (Catskills). Additional members of the “Combination” were added to the list of cooperating witnesses, including Albert Tannenbaum, Seymour Magoon and Sholem Bernstein. Ironically, Harry Rudolph’s testimony was never used in any of the trials, as he died of natural causes in the infirmary at Rikers Island in June 1940. Abe Reles fell to his death from a room at the Half Moon Hotel in Coney Island on November 12, 194 – even though he was under police guard. The official verdict was “accidental death by defenestration”, but the angle of his trajectory suggests that he was pushed. Harry Maione and Frank Abbandando were the first members of the Brooklyn “Combination” to be put on trial for murder. In May 1940, they and Harry Strauss were indicted for the May 25, 1937, ice-pick murder of George “Whitey” Rudnick in a Brooklyn parking garage. Strauss – after agreeing to cooperate with the District Attorney’s office – was eventually excluded from the trial. On May 15, 1940, Abe Reles testified that Rudnick was marked for death after Strauss claimed he had obtained information that Rudnick was a “stool pigeon for the police.” Reles also testified that he waited outside the garage while Maione, Abbandando and Strauss were inside with Rudnick. After Rudnick was believed to have been murdered, Abbandando called for Reles and summoned Angelo “Julie” Catalano to the garage to assist with moving the body. Rudnick was still alive, so Strauss resumed his assault with an ice pick, and Maione used a meat cleaver to complete the job. The next day, Catalano (who drove the automobile with Rudnick’s body) corroborated Reles’ account of the murder. “Dukey” Maffetore and Abe “Pretty” Levine testified that they stole the automobile that was used to dispose of the body. For the defense, Maione and 14 witnesses testified that he was at his grandmother’s wake when Rudnick was murdered. The funeral home undertaker and embalmer, however, testified that Maione was not at the wake. Also, one of Maione’s chief witnesses admitted that he committed perjury as ordered by Maione’s brother, whom he feared. On May 23, 1940, Maione and Abbandando were convicted of first-degree murder, which meant a mandatory sentence of death in the electric chair. New York’s highest court, the Court of Appeals, overturned the conviction on a 4–3 vote in December 1940. A second trial started on March 10, 1941. Maione and Abbandando were convicted of first-degree murder for a second time on April 3, 1941, and were formally sentenced to death for a second time on April 14, 1941. The Court of Appeals upheld the second conviction on January 8, 1942. Maione and Abbandando were executed at Sing Sing prison on February 19, 1942. Harry “Pittsburgh Phil” Strauss and Martin “Buggsy” Goldstein were put on trial for the September 4, 1939, strangulation murder of a bookmaker whose body was set on fire and left in a vacant lot after Feinstein had been strangled. The trial started in September 1940 with Strauss feigning insanity. Abe Reles, the chief prosecution witness, testified that Feinstein was murdered on orders of Albert Anastasia. Reles testified that he, Goldstein and Strauss murdered Feinstein in his house. Reles’s mother-in-law also testified that Reles and Strauss had asked her for an ice pick and some clothesline earlier in the day and, while at the house, heard loud music masking a commotion in the living room. She also testified hearing Strauss say that he had been bitten. Goldstein’s former bodyguard/driver Seymour Magoon corroborated the story, as he testified that on the night of the murder, Goldstein told him that he along with Reles and Strauss had murdered Puggy Feinstein and that shortly after the crime was committed, Goldstein and “Duke” Maffetore burned the body. Goldstein’s attorney decided not to put up a defense. Strauss’s lawyer claimed his client was insane. Strauss was briefly allowed on the witness stand, but refused to take his oath and was “babbling incoherently” as he was led back to the defense table. Strauss then began chewing on a leather strap of a briefcase. On September 19, 1940, Strauss and Goldstein were convicted of first-degree murder, and sentenced to death in the electric chair a week later. Strauss and Goldstein were executed in the electric chair on June 12, 1941. Charles Workman was indicted in New Jersey on March 27, 1940, for the October 23, 1935, murder of Dutch Schultz and three members of his gang. The trial, which opened in June 1941, featured testimony from Abe Reles and Albert Tannenbaum as the primary underworld witnesses against Workman. Next, a female friend of slain gangster Danny Fields, who was described as a “collector for the payroll” of Lepke, testified that Workman showed up at her apartment the day after Schultz’s murder and asked Fields to burn his clothes. The woman (who used a pseudonym on the witness stand) testified that Workman openly talked about the Schultz killing, and how he was left behind in the restaurant. Workman’s defense opened with testimony from Marty Krompier, a close associate of Dutch Schultz who was shot and wounded in Manhattan the same night Schultz was murdered in New Jersey. Krompier testified that Tannenbaum told him that he did not shoot him, as he was in New Jersey and had killed Schultz. Workman, in the middle of his defense, changed his plea from ‘not guilty’ to ‘no contest’ after one of his chief witnesses, a Manhattan funeral director who testified that Workman was employed by him during the time of the Schultz murder and who was the brother-in-law of the late Lepke associate Danny Fields, recanted his testimony. The same day that Workman changed his plea, he was sentenced to life in prison. Workman was paroled on March 10, 1964, after serving 23 years in jail. Louis “Lepke” Buchalter, Emanuel “Mendy” Weiss, Louis Capone, Harry Strauss, James “Dizzy” Ferraco and Philip “Little Farvel” Cohen were indicted for the murder of candy-store owner Joe Rosen, who was murdered in Brooklyn on September 13, 1936. Cohen had his murder indictment dropped prior to the start of the trial, after his conviction on a federal narcotics charge, and received a 10-year sentence. James Ferraco had vanished without trace, and was presumably killed in 1940 or 1941, while Harry Strauss had already been executed for the murder of Irving Feinstein. Securing a jury for Lepke proved difficult. After enough jurors were finally selected, the trial actually started in October 1941. The trial featured the testimony of Rosen’s wife and son, a teacher, and underworld turncoat Sholem “Sol” Bernstein – who was marked for death after refusing to carry out a murder contract on Irving “Big Gangi” Cohen, who had fled to California after the murder of Walter Sage in 1937. Lepke, Weiss and Capone were convicted on November 30, 1941. The Supreme Court upheld the conviction in June 1943. Lepke, Weiss and Capone were executed in Sing-Sing prison on March 4, 1944. I hope you’ll be around, for our next installments. I’ll be looking at some of the Depression-era badmen (and women) who have passed into infamy, and folklore.